1. 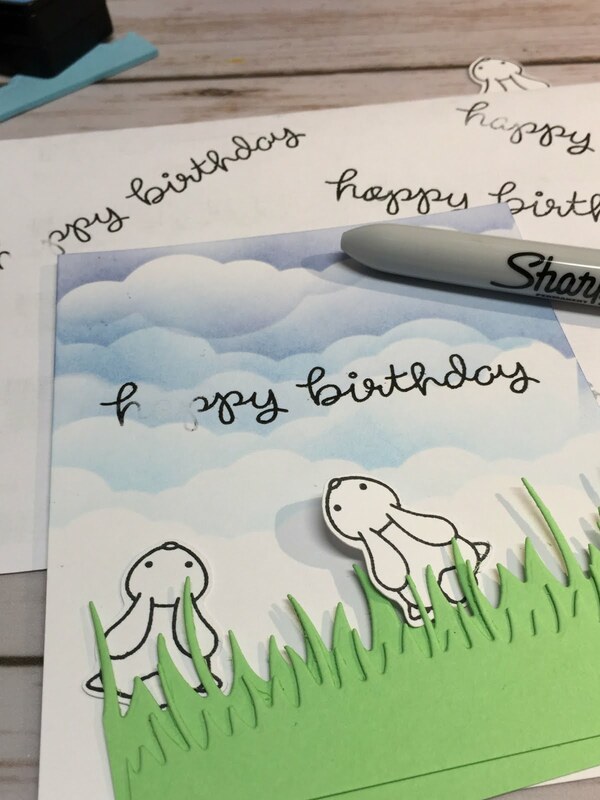 I stamped and die-cut bunnies from the Lawn Fawn Upon a Star stamp set and die set. 2. 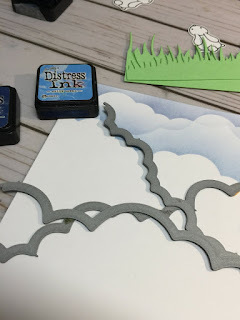 I die cut both borders from Lawn Fawn Meadow Borders from green card stock. 3. 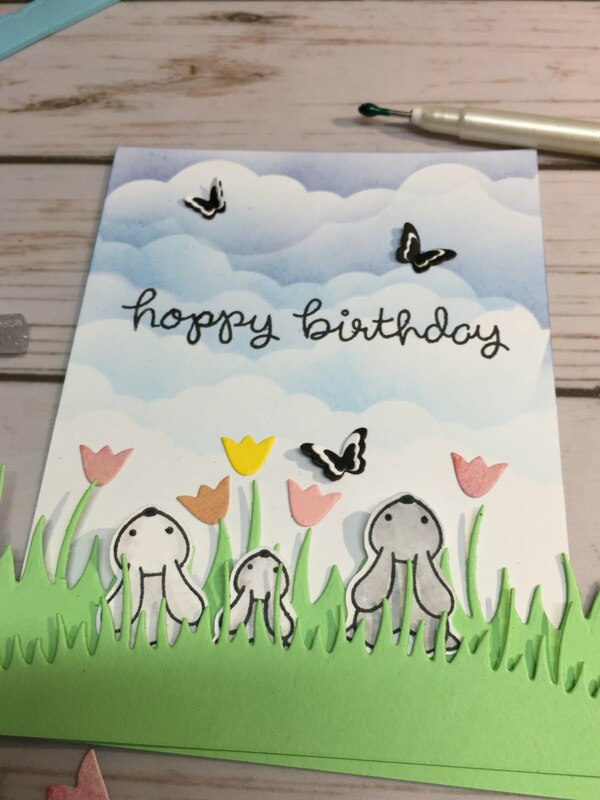 I cut some of the tulips from the Lawn Fawn Meadow Borders set from colored card stocks but I wasn't happy with the colors I had. So, I pulled out my Distress Inks in Tattered Rose and Victorian Velvet, a small paint brush and some water to make some watercolored paper in pinks. 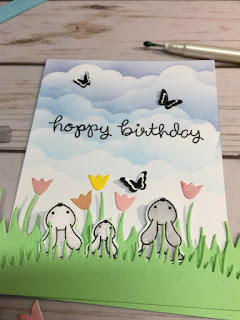 When I was happy with the color, I dried the watercolored piece and used it to cut the tulips with the Lawn Fawn Meadow Border die set. 4. 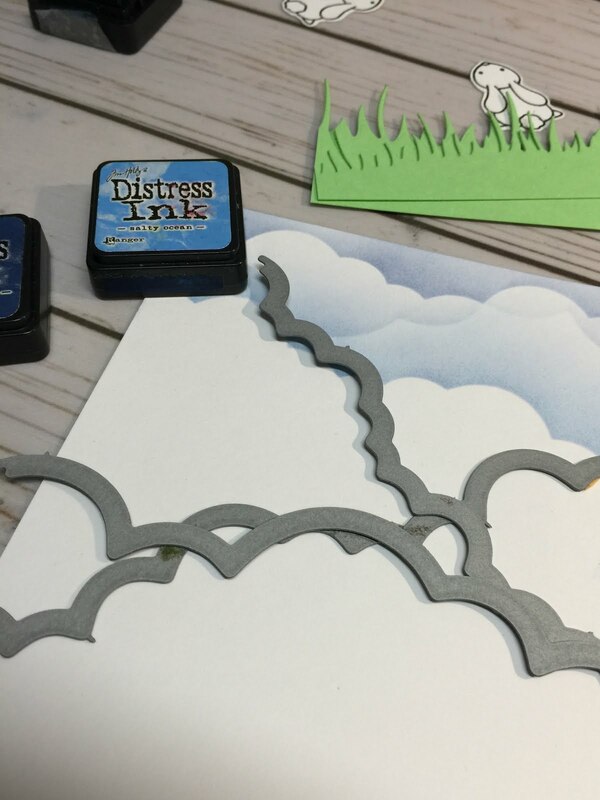 I used all 3 dies that come in the Lawn Fawn Puffy Clouds borders to make masks so I could make my sky with lots of clouds. 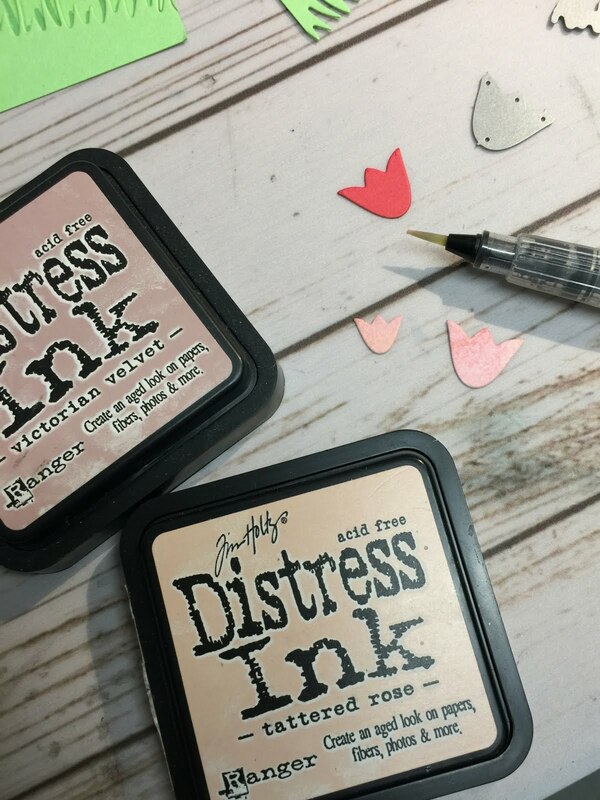 I used a Tim Holtz inking tool for that. The inks I used were the mini Distress Inks in Chipped Sapphire and Salty Ocean. 5. 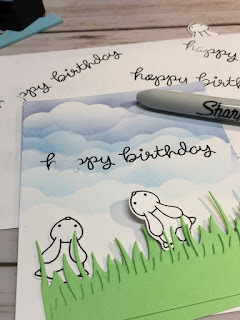 I decided to use the "happy birthday" sentiment from the Lawn Fawn Party Animals stamp set, but I wanted to change the "a" in "happy" to and "o" since I had bunnies on my card! 6. 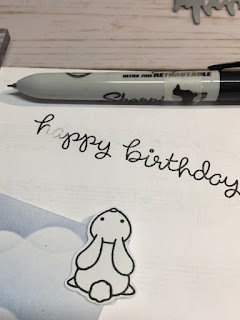 I practiced on some plain white paper, inking up the stamp and wiping away the "a" until I was sure I could do it okay. 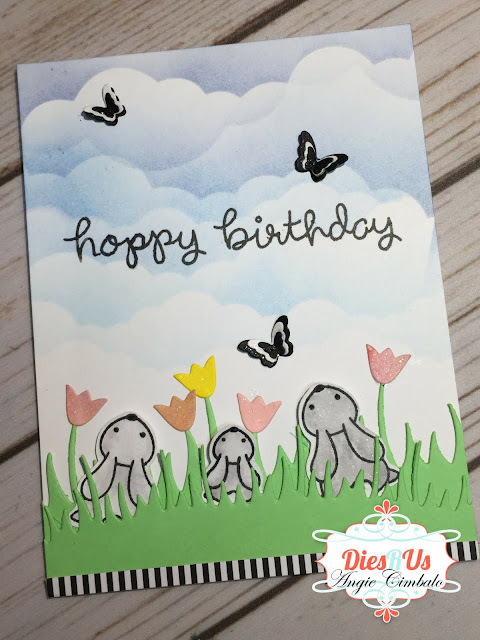 Then I stamped it on my card front - so you can see I also erased part of the "p" too! (Better safe than sorry!) 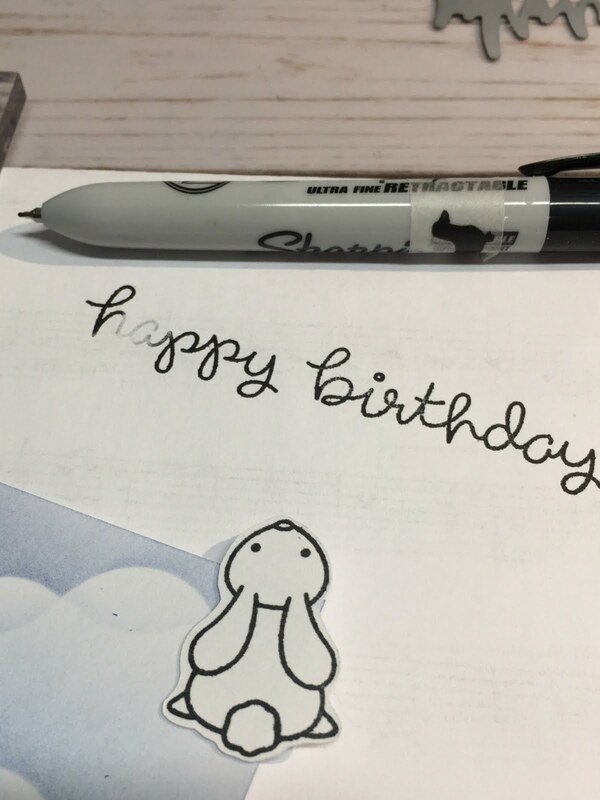 I used a extra fine point black Sharpie to make the "o" in "hoppy." 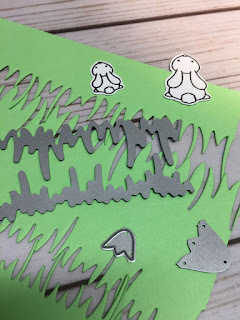 Next, I used Zig Clean Color Brush Markers, water and a small paint brush to color the bunnies a light gray. 7. 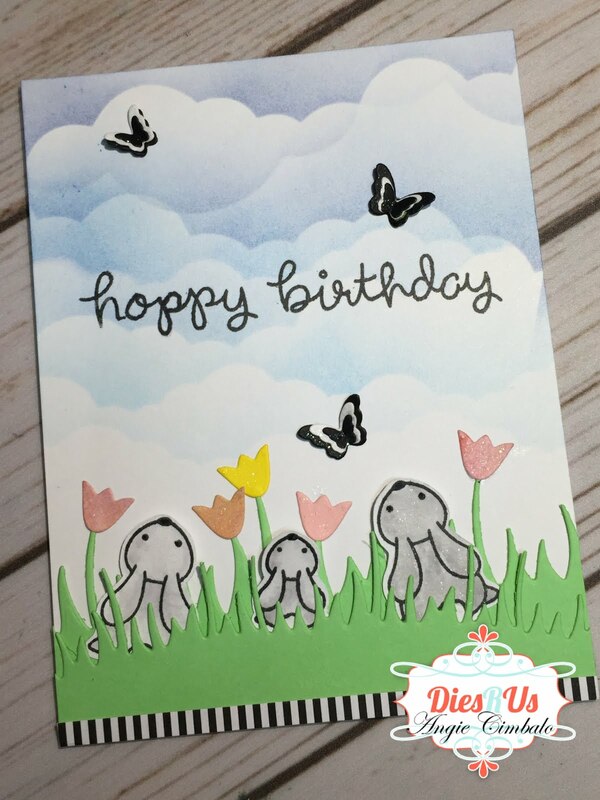 I die cut lots of black and white butterflies with the Poppy Stamps Butterfly Sprinkles die and stacked them on top of each other for some interest. Then I laid all my pieces out to decide exactly how I wanted it to look and took a picture of it. This way I could remember exactly where to put everything. I used liquid glue and some Thermoweb Foam Squares to pop up some pieces. 8. 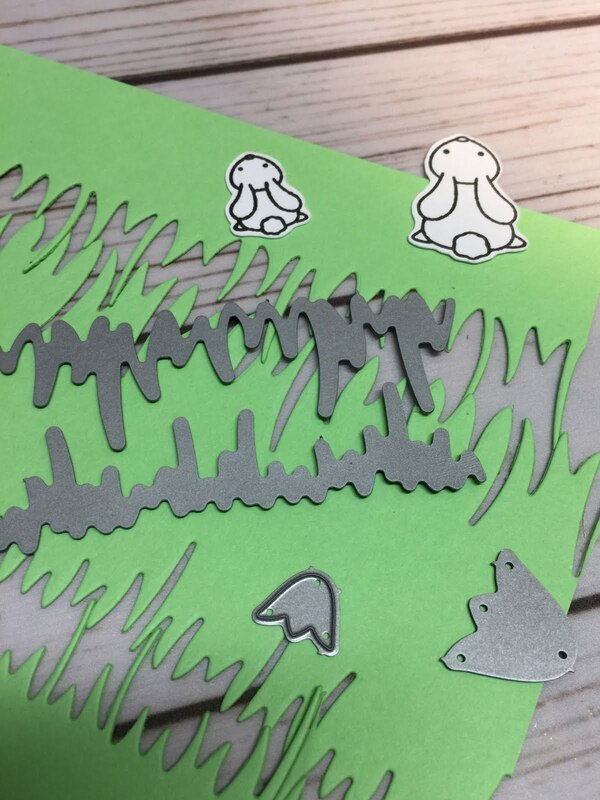 Lastly I added Spectrum Noir sparkle pen to all the die cuts (except the grass) and added a thin strip of black and white striped paper from my stash at the bottom. Here's a closer view so you can see the sparkle! This card was so fun to make and I hope I inspired you in your crafting adventures! Remember, Dies R Us store carries much more than just dies so check it out HERE and happy crafting my friends! ADorable Angie and I get she squealed in delight when she received it! Those clouds are amazing ... will have to give that a try. Thanks for sharing such a sweet creation, awesome details and wonderful inspiration! Super cute Angie! 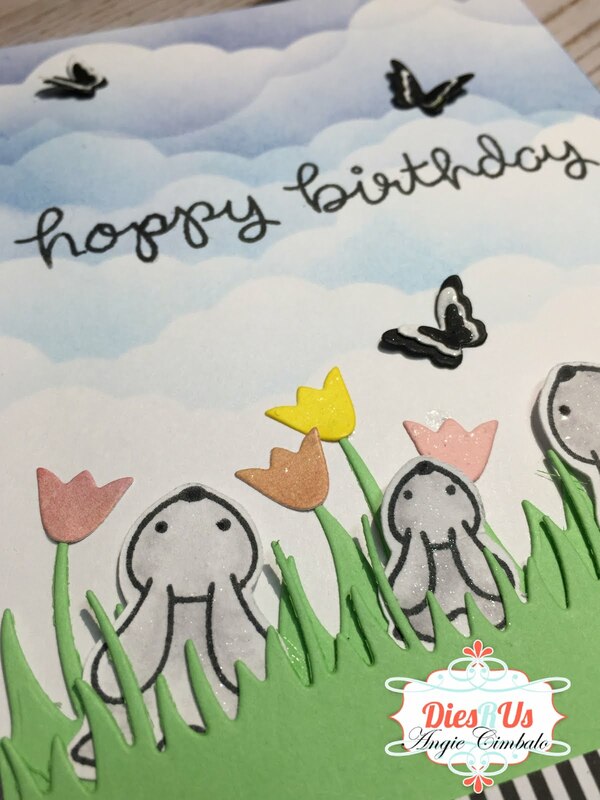 Those dreamy little bunnies are just adorable, as is your sweet card! I am in love with those sweet, sweet bunnies.....they are just the cutest. Perfect card for this time of year! Spring!!! Absolutely adorable! Love the bunnies! Thanks everyone for your sweet comments! I'm so happy to be here!